The ICY DOCK FlexiDOCK MB522SP-B is the first professional 2.5 inch SSD / HDD docking designed for external 3.5 inch floppy drive bays. With the FlexiDOCK MB522SP-B, you can easily turn any legacy and often unused floppy drive bay into a dual bay hot-swappable drive slot that support any 2.5 inch solid state drive or 2.5 inch hard disk ranging from 5mm to 9.5mm height. All drive slots support full SATA 6Gb/s speed and compatibility with SATA’s hot-swap function. Unlike a traditional external HDD docking station that makes the drives stick out from the device, the FlexiDOCK uses a smart drive ejection mechanism which allows the drives to be entirely inserted into the dock for a better system appearance and better drive protection. The easy to operate drive ejection button offers a smooth drive ejection action and is built in with the LED indicator for drive activity. The metal body and air ventilation design allows for efficient heat dissipation for the hard drives within the dock. The FlexiDOCK MB522SP-B is the perfect solution for anyone who needs to quick access their data from multiple laptop size drives, such as media professionals who put their shoots onto solid state disks or IT professionals who backup critical data onto multiple 2.5 inch hard disk drives on daily basis. Bringing an external HDD docking station's quick hot- swap capability into a desktop computer system, ICY DOCK's FlexiDOCK MB522SP-B turns your external 3.5” drive bay into a hot-swappable drive docking. The installation is easy, simply mount FlexiDOCK on the external 3.5” drive bay, and then connect the SATA connectors to the device and you are ready to go. 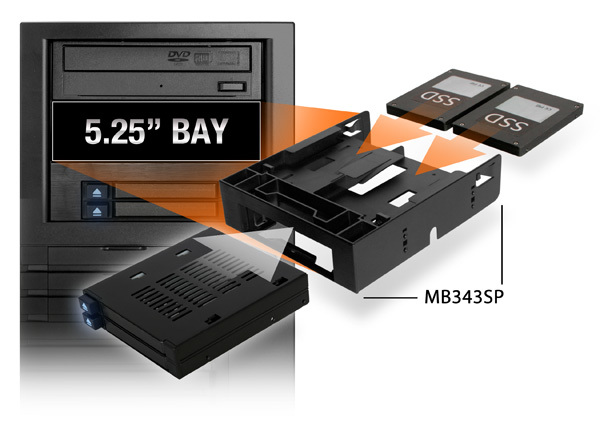 The FlexiDOCK MB522SP-B supports up to 2x 2.5” SAS / SATA SSD / HDD ranging from 5mm to 9.5mm drive height. FlexiDOCK is specifically designed for applications where hot-swap drive is often required. 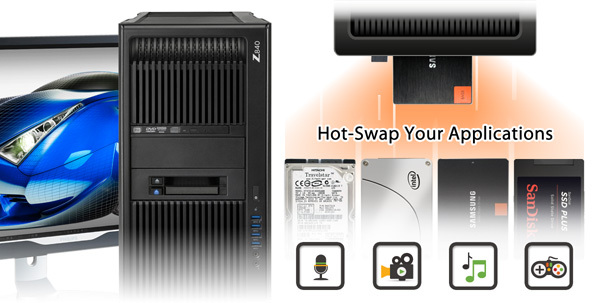 For examples: performing daily data backup to 2.5” hard drives, editing 4K film directly on 2.5” solid state drives, cloning data from HDD to SSD or hot-swapping OS drives are all hot-swap applications. Thanks the unique drive docking design, users can simply insert the drives into the FlexiDOCK and start their tasks. This effortless drive hot-swap capability makes MB522SP-B a perfect tool for professionals who swap their drives on a daily basis. We understand the hassle that screwing a SSD / HDD to a tray can bring and how much times it can cost you when you are doing a lot of drive hot swapping. To make the process run more effectively and efficiently we have removed the door panel from FlexiDOCK in order to get the SSD / HDD in or out quicker. To fully protect the drives we have developed smart derive ejection mechanism design, which allows the drives to be entirely inserted into the device, meaning the drives dos not protrude out and stays protected inside the chassis, reducing risks of physical damage on the drives and offers superior system appearance. When a drive is inserted into ICY DOCK FlexiDOCK, the ejection button will pop out while the blue drive activity light will light up on the button. To eject the drives from the FlexiDOCK, simply push the drive ejection button and smart drive ejection mechanism will smoothly eject the drive making it an easy drive retrieval process. When using FlexiDOCK in an external 5.25" drive bay, Flex-Fit MB343SP can be used as an adapter for converting an external 5.25" drive bay into an external 3.5" drive bay. To learn more about Flex-Fit MB343SP please click HERE. Data backup, data cloning, audio & video editing, digital forensic, drive recovery or any applications where drive hot-swap is required.